Click image to the right to see detail of lapel pin. Measures1.25" across and .5" high. Shiny gold metal lapel pin features the Marine Corps crest circled by the wording A Marine Holds The Key To My Heart . This crest sits on a beautiful golden antique key. 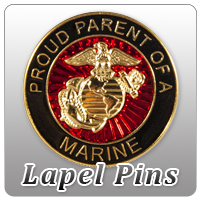 Perfect to wear as an expression of love for the Marine in your life! Love this lapel pin! It's intricately designed showing off the Marine Emblem. The delicate gold key reminds me of your Marine holding your heart. I think I am going to make mine into a necklace!